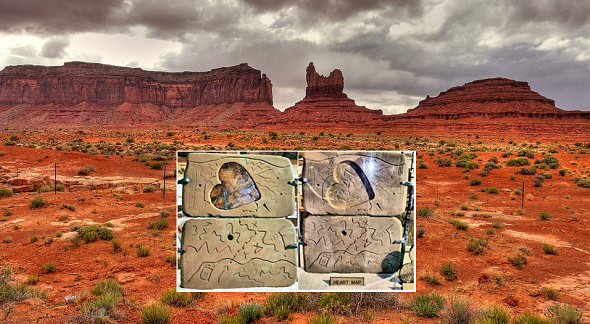 The Peralta Stones: A cryptogram that leads to a lost goldmine? The Peralta Stones are a set of engraved stones. Some people believe they indicate the location of a lost gold mine. Beale cryptograms: The most famous encrypted notes allegedly decribing the location of a treasure. In my view the story is a hoax. Fenn’s poem: To find the treasure hidden by millionaire Forrest Fenn you need to decipher a poem. La Buse cryptogram: Olivier Levasseur (“La Buse”), a pirate in the Indian Ocean, is said to have hidden a treasure, the location of which is described in a pigpen cryptogram. Rennes-le-Chateau cryptogram: This encrypted message is well-known since Dan Brown’s novel The Da Vinci Code. In my view it’s a hoax. Oak island cryptogram: Oak Island (Nova Scotia) is known for various theories about buried treasures or strange historical artifacts. One of these theories includes a short encrypted text. In my view it’s a hoax. Musical cryptogram: There’s a story about a Nazi treasure and a musical cryptogram that leads to it. It’s probably another hoax. According to the book The Man Who Breoke Purple, master codebreaker William Friedman received many inquiries regarding encrypted treasure descriptions. I wish, these inquiries were available in some archive, but this seems not to be the case. 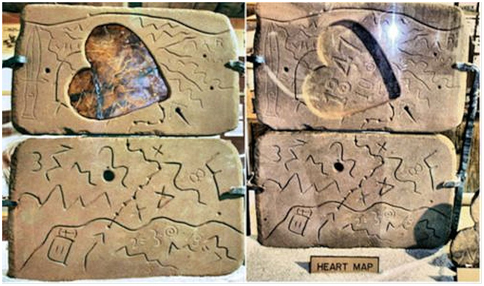 Thanks to a Facebook comment by Mark Buono I recently learned about another story that fits into the “treasure cryptogram” category – the Peralta Stones. The stones consist of “two red sandstone tablets and a heart-shaped rock made of red quartzite. Each block is approximately 8.25” (~ 21 cm) by 14” (~35.6 cm) and 2” thick, weighing about 25 lbs. Each red stone block is carved with lines and one long line. When the two blocks are placed side by side and the stone heart is inserted the long line has 18 dots pecked into it. This style of map is known as a Post Road Map and it is a style used in Mexico and Spain during the Mexican–American War. Inscribed on the stones is the date 1847, and one stone contains a relief of a heart, which the heart-shaped stone fits perfectly. The heart shape fits neatly in the second stone. The back of the stone that the heart-shaped stone fits into has the outline of a cross carved on the back. The back of the other stone has the word DON carved into it. The two red sandstone map pieces are displayed with a third white sandstone of similar size and weight as the red ones. The history of the white stone was cited by an author using the moniker ‘Azmula’. Azmula cites the history in the Superstition Mountain Journal, issue 27 of 2009. He attributes the original citation to M. Kraig Roberts. Mr. Roberts’s article is titled “History of the Chain Of Possession Of The Stone Maps”. The Journal article is a history of the white stone. The white sandstone has a side showing a Priest who is assembling the Peralta Stones to form the map. The reverse side is known as the Horse Map. The Priests Stone contains Spanish text that states that to find the gold you must find the heart. The lower half of the number 8 in the red sandstone map has a small heart carved in the circle. Try to grasp the size of this “land grant” and the background work to claim it. Two attempts. da werden die Steine erwähnt. Könnte man vielleicht in der ZDF Mediathek finden. Loved this article! PS: Is that the Voynich manuscript in your profile photo? 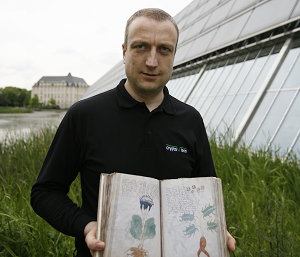 @Abhishek: Yes, it’s a facsimile of the Voynich manuscript. These petroglyphs seem a hoax. There are some strange misspellings in Spanish. I don’t know if they were made on purpose or not but it’s a bit odd. (Translation: This path is dangerous/I go to 18 places/Search for the map/search for the heart). But “vereda”, “peligrosa”, “voy (a)” and “corazón” are misspelled. Yo pasto al norte del río”. (Translation: The horse of Santa Fe/I graze to the north of the river). The word ‘cobollo’ doesn’t exist but ‘caballo’. The text seems to have been written by an illiterate person, I guess. Or a non native person. I think it’s just a guide map to old mines where Pedro and Miguel could have worked in the past. Well, before sending this comment I have been looking for the strange word ‘cobollo’. I have found out the family name Cobollo does really exist and it’s located in New Mexico. So now I don’t know if this will have something to do with these stones.